It puzzles me that some would think that students sitting in classrooms with their hands stilled would be a good thing for the intelligence of our nation's kids. There are countless examples otherwise. Our most creative scientists and inventors are not idle in their pastimes. Alex Slocum, a leading professor at MIT is one of those pushing the frontiers of science, and in his spare time is an amateur woodworker. Columbia University Professor John Mutter, whose work at the Earth Institute has helped reshape our understanding of the earth is an amateur painter. Others may do all kinds of other things as "pass-times" that offer creative opportunities within their inventive minds. Seymour Cray who invented a series of computers that for years were the fastest in the world spent his evening hours and weekends digging a tunnel from his basement to a distant woods. And those who do not understand creative engagement in the real world would think that these examples are absurd and unrelated. They are not. The way this works, for those of you who are not presently creatively engaged is this: Creativity is accomplished through the engagement of the left and right hemispheres of the human brain. The frontiers of human thought are pushed through the use of metaphor, the development of which is an exclusively right brained function. Nuts, bolts, spreadsheets and the like are one thing, creativity requires a more expansive view, and one thing you can see is that Slocum in his wood shop, Mutter at the easel, and Cray in his tunnel have in common is the opportunity for right brain engagement that comes as both hands are expressively engaged in doing real things. I'm never quite sure how to explain all this but I'm trying. In the lives of real human beings (here I'm talking about those who cannot be nailed down in spreadsheets), the shortest distance between two points is rarely a straight line, and certainly not an express lane. In Chinese philosophy, the I Ching, it would be called "happy wandering." We may have perfect destinations that are only arrived at through taking circuitous routes. If you watch the news, what you will see are greedy, ill-informed, rude, thoughtless, and stupid behavior by those who had missed the opportunity to benefit from the creative engagement in making real things. A person learns a few things from craftsmanship. You learn honesty from the honesty of real materials. The materials will not lie, nor will they completely hide your character as a failed or careless craftsman. You learn humility, for attempting to accomplish difficult things will test your foolishly inflated reckonings of self. You will learn in time to create things that inspire others, serve others in simple ways, and in doing so will discover the simple un-inflated truth of your humanity. 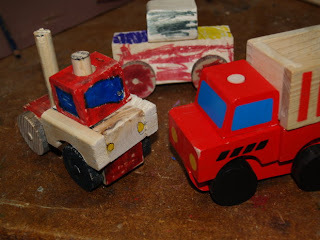 The toy truck at left in the photo above is being made by a first grader using the model shown in the same photo at right. 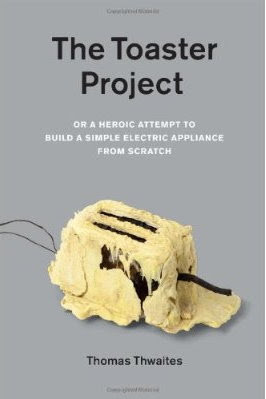 The project was his idea. 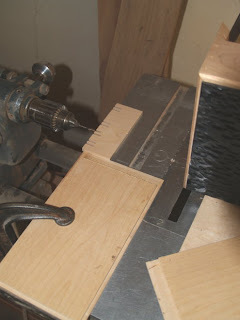 I've helped by making a couple scroll saw cuts, lending my pen, and setting up the drill press to drill the right sized hole. My student even wanted to change the drill bit himself, and he did. All of the first, second and third grade students in todays classes said things like "Wood shop is my favorite class." And Wednesday is my favorite day because we have wood shop." Get it? This morning, I am working in my own shop for a bit, and will have middle school students in the afternoon. When I am at work in my shop, some of the work is routine, allowing my mind to wander, and as you might guess much of what I think about is the hands. We have developed a model for education in the US in which teachers stand at the front of the class and deliver as much information as they can in the hopes that enough of it will stick that their class as a whole will test well enough to justify what they are paid. It is certainly not quite that bad in elementary schools, where the pressures on student achievement are not so grave. But as students advance through school, the pressures increase and the fun diminishes. Parents have high expectations. Administrators and teachers have high hopes, but students themselves, are left wondering, "What in the world am I doing here?" and "Why is this so boring and so little fun?" And the saddest question of all, "What's in it for me?" The hands offer a path forward. Put the hands in use, with each child actually doing interesting things, using real tools and education becomes real to each child. The use of the hands engages all the senses, sight, sound, smell. It engages all the child's innate capacities and interests. If we put children of any age in classrooms, proceed to address their minds while ignoring their bodies, we create a situation that fails to engage. From the New York Times: René Morel, Master Restorer of Rare Violins, Dies at 79 He was one of the greats whose careful handwork was responsible for sustaining much of the world's best music. Also from the New York Times, The Machine That Makes You Musical is an article about how iPad applications allow the machine to be used to simulate a variety of musical instruments. It is certainly a wonderful thing to think that everyone should be involved in making music, or loving music, and playing music with others from around the world, but is it OK that that music be played without effort and without skill? Is that how we can best arise as skilled and creative human beings? A third interesting component is that the company that makes Guitar Hero has announced that it is going to discontinue the product. It was introduced in 2005, and had children across the US pretending they were rock stars while strumming along, not making real music, but pretending to do so. It was a high profit item for some time, but as sales have fallen, the company is moving on to other things. Can you see some interesting things in this juxtaposition? Are there cultural values at risk? It is said that human culture must arise anew within each generation. Perhaps in the long run we will be left fiddling around on real fiddles, with our own musical inclinations having been abandoned by developers as they race along to new profits.... Perhaps a good thing. It is best when human culture is hands-on and arises within the agency of our human hands. 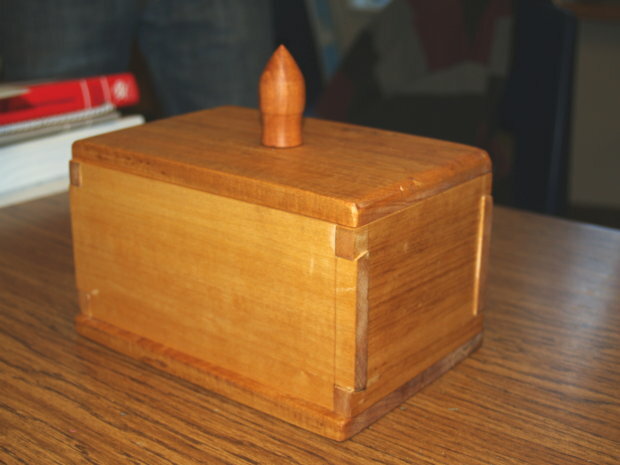 Today in the CSS woodshop, 4th, 5th and 6th grade students made toys and the high school students turned wood and cut dovetails.The first dovetailed box is complete as you can see in the photos above. This morning as I was moving in and out of a lucid state, I was thinking about sharpening things, the character of steel, how it can be hardened and marked so it can be used to cut itself, as in the making of files for sharpening saws and shaping steel. You can take a hardened steel tool, use it to mark soft steel, then harden that steel and use it to file on wood or metal. That process is truly the foundation of all modern human culture. We would be napping flint and wearing animal skins without that foundation. We would also live in endless forests, for it was the making of charcoal to support the making of iron, that exhausted the forests of most of the ancient world from which our western culture grew to dominate the entire planet. I had a friend for many years who owned a lumber yard in downtown Eureka Springs. After work when the yard had closed, he would sit at a bench and sharpen saws. A straight carpenter's hand saw could be filed sharp for a dollar or two, and circular saws could be filed for a bit less depending on the number of teeth. It was something Warren did when all his employees had gone home. It made extra money and gave him meditative time to reflect on all those things that had arisen in the course of the day. No doubt, he gave some time in thought to the owners of each saw, as each was marked with the name of the craftsman who had worn its teeth cutting wood. Now we have carbide blades that require more sophisticated equipment, and saw sharpening has become more complicated than a man sitting at a bench with a sharp file. Most carpenters just buy new blades. Years ago, when I bought my first Japanese dozuki saw, they too were saws that could be sharpened, and Japanese craftsmen were known for the ability to file the full blade flat, and then re-file and reset new teeth one by one down the full length of the blade. I tried it one time and found it to be very difficult and time consuming, a thing that would only come easy through long practice, but in the old days of craftsmanship, time was less a pressing concern. Sharpening was a time to reflect on your day and express concern toward other matters. Sharpening was a thing that you did so well that as you moved from tooth to tooth, your hands cutting each one precisely in skilled manner, your mind was freed toward a more expansive state. Can you begin to see what we are losing here? The "ease of use" in the products designed for us, means that no skill must be earned in their operation. There can be no earned sense of awe in our developing capacity. We become expendable rather than expandable in that anyone with the same machine can take our place without investing in his or her own development; without aptitude, which now, too, has become of less importance. In my semi-lucid state, I began to wonder what would become of us if the grid failed, or the Internet went kaboom? Where would we be with our devices? Remember when tools offered ceremonial use? Do you remember when they were used with reverence, and when they gave rise to skills within the hands and minds of those who used them? I am just asking for a bit of remembrance and restoration. There are parallels between a sharp tool and a sharp mind that we should be thinking about. But no, I'm not asking you to give up your iPad. Just give it to your cat who can operate it with nearly the same level of proficiency and interest as you, yourself or I.
I spent yesterday at the the Fine Art Show sponsored by the Eureka Springs School of the Arts. The show is more successful for some artists than for others. There, I am surrounded by some of the finest work by artists and craftsmen in the state. The work is beautiful, but as one of the artists mentioned to me, when times are tough, one of the last things a person may need is something decorative, regardless of how beautiful that thing might be. While I do not agree with Wilde completely, and do find beauty in many useless things, and find the artist's growth expressed clearly therein, Wilde's observation might be of use to those who aspire to make a living from their work. How can we make things that are both useful and beautiful that thus have value in enriching people's lives even in the most difficult of financial times? I have been fortunate to have practical leanings in my inclination to make. And this is not intended to slight the painter in his or her craft. Some of them have told me of their own longing to make things that are useful -- that they themselves might use each day rather than just have the things they've made take up space. I offer the following advice to craftsmen. Make things that are useful. Those things that offer humble usefulness in addition to their simple beauty, may define a clear path toward the artist's success. These things being used, will grow in beauty until they are used no more and those who have used them will then seek replacements that might offer the same rich character. The following poem makes a useful point. I know I have many readers of the blog throughout the world, not just in the US. The cartoon of "Thxgiving" may help you know what you missed in yesterday's celebration of our national holiday. Today I will sell my work at the Fall Art Fair in Eureka Springs. There will be fine artists and craftsmen selling their hand-crafted work and wares. The location is the Inn of the Ozarks Conference Center and the hours today will be noon to 6 PM and the hours Saturday, 9 AM to 6 PM. Come and buy art. 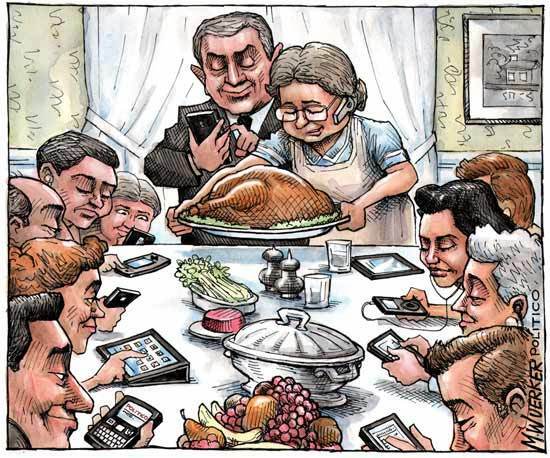 We have become so fixated on our electronic devices, that they intrude on everything... even those things that should be sacred and held as most important. If we are glued to pictures under glass and trapped in the one finger means of expressing diminished human agency, when will we make art? This morning is Thanks-giving Day in the US. 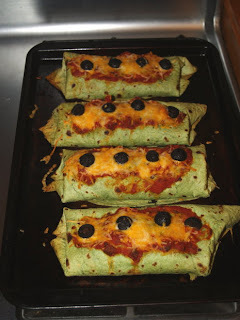 Here people are up early to cook and to prepare wonderful meals for friends and family, and this is my favorite American holiday. In addition to cooking and eating, we also reflect on the many things that we have to be thankful for. I have more than most. I was reading in the paper that the jailers of Carroll County are getting a raise. I am thankful to not be a jailer. In fact, being a woodworker, having a wood shop, knowing how to make beautiful and useful things, being given the opportunity to teach woodworking and write about woodworking have been great gifts, for which I am thankful. My daughter Lucy is home for thanksgiving. Since she was away for college in New York City for the last 4 years, this is her first Thanksgiving to be home with us in that time. And so, as you can see, the real important values have to do with family, and with those things of greater value we can offer to our own communities. Believe it or not, those things take work. They don't come easy. Being a person who can offer lasting value to others takes more real work than we might have been led to expect. We are doing some things in American education and American culture that concern me, that will undoubtedly undermine the potential for thankfulness in our children's futures.We give them pictures under glass to be manipulated by sliding fingers. Ease of use technology is a trojan horse of human demoralization. It makes things seem that they should all be as easy as one finger sliding over glass. Our children watch things happen on screens having barely lifted more than a finger to set things in motion. These things offer a false sense of agency in which no for real agency exists. Comparing that to less entertaining challenges of doing effort-filled-things in real life, our children tend to give up before having barely tried to do real work. As their teacher in wood shop, I urge, "Now that you know how hard it is, try again." Ease of use is the anathema to human development. Unless we give our children real challenges they will not know that it can take so much more than fingers sliding over glass to arrive at a place in which the best of thankfulness can be felt and measured as connected with the real stuff of which human life is made. 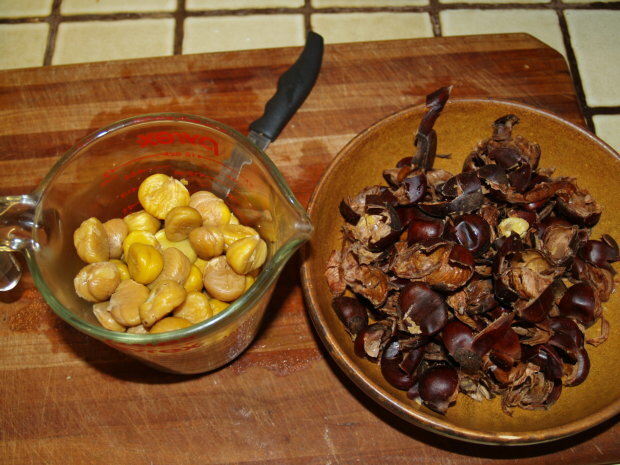 Boil 5 minutes so the shell and skin can be removed. 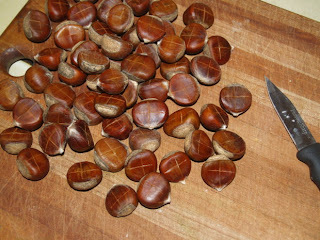 In the photos above you can see the preparation of chestnuts. First cut an "x" on the flat and then boil them so they can be peeled. These will next be oven roasted and used in stuffing. 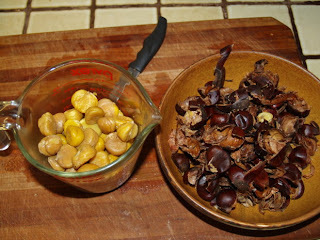 These are locally grown Chinese chestnuts, as our indigenous variety of chestnut, the chinkapin, was lost to the chestnut blight that killed most of the native chestnut trees across the US. "Imitation is instinctive, and the teacher who does not utilize this natural force fails to avail himself of one of his strongest allies." Every teacher of handwork knows "that the easiest and quickest way to get a boy to hold and use a tool correctly is to show him how to do it. Often it is not necessary to speak a word; to do the thing in his presence is sufficient." The second method is that of Discovery or the "heurisic" method. Bennett quotes Charles Bird, Supervisor of Manual raining in Leicester, England. "It will hardly be denied that the normal child possesses in a marked degree such characteristics as curiosity, inquisitiveness, a love of prying into things, of questioning and doubting, which are frequently amusing and sometimes embarrassing... It is these characteristics, so preeminent in their importance as assets in after life, which a reasonable system of education handwork can stimulate and strengthen. For this purpose the children must be allowed to depend upon their own thought and judgement in doing things." I think that you can see that there must be a natural balance between showing things and knowing when you are showing too much, as part of the process of teaching is that of preparing the ground for children to make discoveries of their own. "The inventive method places the worker in a relation to his work that is entirely different from that in the imitative method. It places him in the position of a master, of a person with authority and power to control. If a student is working from a blueprint or other working drawing given him by the teacher, he is expected to follow the drawing exactly in material and form and dimensions... if he has designed or invented the piece he is making, he is the guiding force in the work; he can change material or form or dimension. His own ideas are to be carried out, not those of some other man, except, of course, as he takes advice from the teacher." Bennett notes that all three of these methods are important and should be balanced in the course of instruction. The purely imitative method alone can be rigid, oppressive and uninspiring. The discovery method or the inventive method alone without the foundation of imitative instruction can lead to poor workmanship and deficient products. "If the schools are to produce citizens with (a) skill, (b) initiative and (c) power to think for themselves--those who can follow directions efficiently or can invent a better way, all three methods must be employed in teaching the manual arts in schools." You will possibly notice that skill, initiative and power to think creatively are often lacking in the graduates of American education. We need to bring back wood shops and teach in the three methods that Bennett describes. Today I was off from school to prepare for Thanksgiving. 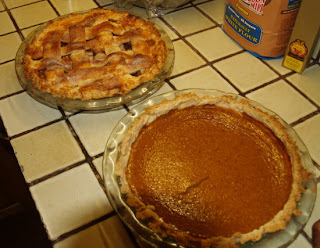 I'll was in the wood shop for a short time, and then baked pies and baked burritos for dinner as you can see in the photos above. The baked burritos are imitations of one I ate in a restaurant in Madison, Wisconsin. The pies are from recipes in Joy of Cooking. In my case, everything in the kitchen is related to all three methods of learning, a bit of imitation, a bit of discovery and a bit of invention. We live in a world in which so much pressure is put on children to perform. Reading was once a gentle thing, learned at the pace of the child, but now children are considered failures if they are not reading and writing in kindergarten or first grade. Jim Henry is 98, but was unable to read or write until he was 96. In the nursing home friends learned that he was illiterate and began to teach him with the gentleness with which reading and writing should be taught in the first place. He then began writing his history and now has published a book about his life as a fisherman. He had been a lifelong lobsterman and the captain of 3 fishing vessels. So now Jim Henry describes himself as the happiest man in the world. He is a late bloomer. I saw a news segment on the new director of the International Monetary Fund Christine Lagarde. She had gotten in trouble in a speech in which she had informed the nation of France that they are "thinking too much," not giving enough of themselves to direct action. Isn't that the way of things? We get balled up in positions like those taken by our "Super Committee" in Congress, in which they pretend to think and think about issues and end up doing nothing except protecting their own personal self interests. It is time for us all to become late bloomers. Take matters in our own hands. Solve real problems. Take our children to wood shops where they can learn that actions speak louder than words. We are moving rapidly into the age of our incapacity. While Captain Jim Henry could pilot vessels and return safely to port year after year with his catch without knowing how to read and lived to tell about it in his first book. Our children, in stark contrast will be much like our politicians, capable of diddly squat. Give them real life experiences on the other hand, and they may read and write when they have interests to pursue and something worth writing about. I am a firm believer that we all need to do difficult and demanding things. We are not best defined by a narrative in which we describe all the many ways things have been made easy for us, but by having faced things that have been difficult... that have pushed us to discover our limitations and to surpass those which we were able to surpass. Matti Bergström had said that culture must arise anew with each generation. Personal narrative is the means through which we sustain ourselves and fabricate meaningful lives. Joshua Slocum was the first to solo circumnavigate the earth. His was a remarkable story, and if you have not read Sailing Alone Around the World by Joshua Slocum, I recommend it. It is a story of personal triumph over many very difficult things. The book I am reading now the Hard Way Around, by Geoffrey Wolff is about Slocum's whole life. And we learn that the circumnavigation in his small craft Spray was not his first voyage, for he had circumnavigated the planet 4 times before in command of much larger vessels. In an earlier "honeymoon" voyage to South America with his second wife, his ship, the three masted Aquidnick had disintegrated and sunk near Paranaguá, Brazil, and he personally built another smaller boat, not much larger than a sailing canoe from its remains which he called the Liberdade in honor of the end of slavery in Brazil. Liberdade was an extremely small vessel with no amenities and hardly any room below decks. When his wife Hattie was asked about her voyage by a reporter from the New York Tribune she answered, "It is an experience I should not care to repeat, although now that it is mine I feel a certain satisfaction in having gone through it." From my perspective the bicycle trip was an opportunity to help Jesse on his journey to adulthood, and present him with a rite of passage experience. I felt that if I didn't do something big with him when he was 15 I'd not have a chance later as girls and other distractions would take over his life... Any younger than that and it would be unlikely that he'd have the physical and mental strength to succeed. I saw the trip as a chance for us to bond and have a unique shared experience that was ours alone. I think the trip was a huge success in those regards and in two years when my other son Joshua is 15 we plan to undertake a big adventure also. Before we left I'd hoped Jesse would learn how to make decisions when faced with sub-optimal alternatives, learn perseverance, and learn how to overcome problems while on the road. It turned out that there were a lot of learning opportunities. Those opportunities ranged from coping with extreme heat and elevations of over 11,500 feet above sea level; to finding food; and coping with flat tires and defective tires. A few other things that had to be dealt with were the aftermath of a bad crash that Jesse took early in the trip that did a lot of damage to his equipment; and later dealing with a crash that I took in which I injured my left knee and from all indications cracked some ribs. We were in remote locations where towns were a significant distance from each other and frequently had populations of under 30 people. We often had to make do with what we had as there was no place to buy supplies or parts. Jesse described himself as "a different kid" when we got back home and he is a different kid. Before the trip he had good relationships at school and had no problems with any of the kids. That didn't change. What did change is his attitude about his classes and his desire to do well and study. He has stepped up as a leader in his Boy Scout troop and in school... he is now a role model for the younger Scouts and he encourages and helps other kids in school. I think we had a great relationship before the trip but now we've got an even better one and have things that only we understand. For example, when we hear people complaining about things we grin at each other knowingly as what they are talking about often pales in comparison to the challenges we faced. Needless to say, I'm really proud of Jesse. For me personally, this latest bicycle trip reinforced the notion that if you keep moving you can keep moving. Sure I ached at times, and I didn't bounce like Jesse when I crashed, but I did ride a bicycle over 1,600 miles through the Rocky Mountains and the high plains of 5 western states. I can live with that! On the bike trip over the summer I learned a lot about myself. I learned that if I put my mind to whatever I want to achieve it can happen. This bike trip meant a lot to me. I look back on the pictures and I remember how I got there and I feel a sense of success. Now, because of the bike trip, my dad and I are both a lot closer. Now I can actually talk to him easier. Also, because of this bike trip, my dad and I both know each other's weaknesses and strengths. As so many parents are so deeply concerned about finding ways to make things easy for their children a person must wonder why. Would it not be better if we joined them on some form of quest that tested their metal and our own? My thanks to John and Jesse for sharing their observations and for embarking on such an inspiring journey. I suspect they were an amazing example for all that they met along the way. The photo above is Jesse crossing into the state of Washington. Bret Victor who created a wonderful rant on pictures under glass asked, "I'm curious what your thoughts are on CNC mills, and designing objects in CAD software instead of working by hand." There are feelings and values that are lost in automatic making. And there are things on the other hand that carry a sense of personal provenance, a personal narrative of sacrifice and effort. We know that the high-tech world is sold on the promise of once difficult things being made easy, so that anyone who can buy the device can do these tasks without training and without effort. But if anyone can do it without training and without effort, what will its value be? The enabling device will have value but the task to be accomplished little or none. A number of years ago, my mother who would shop at thrift stores on occasion gave me a small pen holder with a laser engraved sailing ship on the front. She bought it for only 50 cents, because it had become meaningless to its previous owner despite being made of fine wood with the intricate engraving on the front. I suspect that if it had more human engagement rather than the attempt to make it appear human through the use of automatic processes, it might not have been sold so cheap and may have had greater value. I make things that are difficult and require effort of both hand and mind. I compete in selling these things with objects that are impersonal, carry no sense of who made them, and I compete in a marketplace that has very little training to sense the difference. More and more I make my living by training others to witness a different sense of object, that of seeing and feeling it arise through the personal agency of their own hands. There is a sense of personal agency that arises in creating things through difficult means. When you set up a machine to make things, you can watch the machine do its thing. The process is under glass, with no sense of tactile engagement, so just as the small pencil holder given me by my mother had no value, no feelings, and was made without difficulty, the objects made have no greater dimension, no greater intrinsic value. They may have the same use and even the same beauty as something crafted by human hand, and yet be lacking in human qualities. The density of nerve endings in our fingertips is enormous. Their discrimination is almost as good as that of our eyes. If we don't use our fingers, if in childhood and youth we become "finger-blind " this rich network of nerves is impoverished - which represents a huge loss to the brain and thwarts the individual's all-around development. Such damage may be likened to blindness itself. Perhaps worse, while a blind person may simply not be able to find this or that object, the finger-blind cannot understand its inner meaning and value. Those who shaped our age-old traditions always understood this. But today, Western civilization, an information-obsessed society that over values science and undervalues true worth, has forgotten it all. We are "values-damaged." Salomon also noted that the value of the carpenter's work is in the object, but the value of the student's work is in the student. What great benefit is accrued to the individuals within our civilization through the effortless production of vast quantities of meaningless stuff? The key to having a greater understanding comes from an old saying quoted by Comenius. 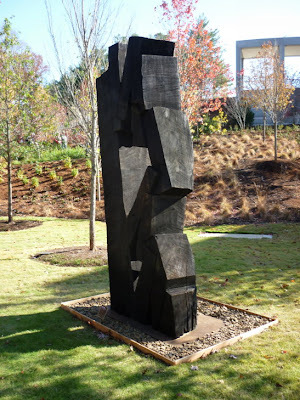 "We give form to ourselves and to our materials at the same time." In other words, the maker of beautiful and useful objects busily crafts himself or herself in finer form. It is an alchemy of sorts... lead into gold, and if the character of our objects is so lacking in human difficulty, human feeling and dimension, what will that say about ourselves? Make, fix and create... meaningful things, meaningful lives. Today I am making boxes again. It is a usual thing for me this time of year. These are being secured at the corners using small dowels, so they have a bit of texture added in the corners for accent. To drill the holes for the dowels I am using my 1948 model Shop Smith as a horizontal borer. This gives me more accurate placement and depth of the holes than I could attain with either a drill press or hand held drill. You can see that I also use a story stick for this operation to exactly position the blocking that holds the box in place for drilling. Without the story stick things could get really mixed up. With it things are still complicated. But this is all about hand and mind. Not one or the other. You can see in the photos above and below, the process of drilling and the story stick used to define where the holes are to be drilled. And so while my younger OWS brethren are sleeping in tents, or were recently evicted from tents, I have the luxury of wood shop. I started a fire in the wood stove this morning using scrap wood, and it is now toasty and ready for a fine day of work. At one point, it seems to have been decided that greater wealth would be deserved by those who manipulate markets and values than by those who actually produce real goods and services for others. My point is not that woodworking should be selling for more than it does, but that we need to re-cultivate a society that has its values placed on productivity rather than manipulation. The OWS movement has been criticized for not clearly expressing what it wants. As one who has spent so many hours and days in the wood shop, I know exactly where they are coming from. Most would like to work at something that offered a sense of dignity and a sense of security about the future. Between American corporations and their paid minions in the US Senate and House of Representatives, American productivity has been held hostage. Few of the demonstrators would know of their own potential as their educations did not include wood shop. Readers will find value in this blog post by Nicholas Carr, People in glass houses should throw stones. 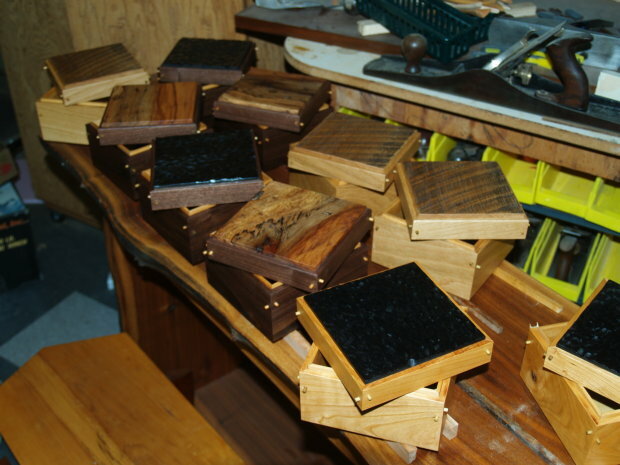 I have been occupying my wood shop for over 35 years, and have great admiration for the Occupy Wall Street movement. My occupation is a lot more fun, but maybe no less important. But we seem to be on the same page. At some point, in American education, it was decided that all kids would go to college, none of us would need to work with our hands anymore, children would need not be trained in any form of creative art or craft, and the smartest of our children would go to Wall Street where their lack of training in anything practical would allow them to steer our nation's big corporations untouched by common human values as they lay false claim to our nation's wealth. The rest of us would be lulled to complaisance by a vast array of inexpensive imported goods. It is time to bring us all back in touch. Thirty five years ago, I felt compelled to do something against the flow. I chose to become a craftsman. Malcolm Gladwell, Richard Sennet and others have claimed that there is a 10,000 hour rule on attaining mastery of something. I'm running at over 10,000 days at this point and still learn something new each day... the perfect opportunity for a lifelong learner. I've been lucky enough to get fairly good at a few things and one of those is making boxes. 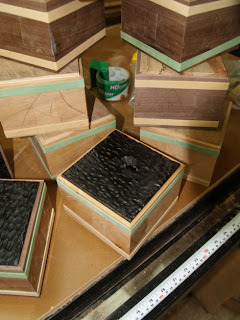 So today I am making more boxes. One of these days I'll need to sell a few. That is often the hard part, since so few people anymore have a sense of the value of objects that do not have all the bells and whistles associated with the electronic gizmos that inhabit our lives and command our every attention. While humans once lived with objects that had direct provenance, that were made by members of their own family or tribe, or by their own hands, we now live lives filled with objects that are made with no real human concerns but those of a bonus for the CEO and profit for the investors. Where did it come from? Who cares? Who made it? Again who cares? What happens when we are tired of it or it breaks? It goes to the landfill, no sweat. I thought about embedding this video for you, but chose a much better one instead. I urge you to join me in occupying a wood shop of your own. Get in touch with your own creative spirit, and invite others to join you as well. There is something wonderful about being involved in making things of useful beauty and having the capacity to do so. Yesterday in the blog post, Why Children Need Wood Shop, I mentioned the ages old notion that children learn best from their senses and activities. Howard Gardner took the basic human senses, and described them as specific intelligences, (adding a few to boot) and then prescribed a model of education in which teachers would devise lessons to make sure the full range of intelligences would be encompassed in the teaching of their kids. His notice that children (and we all) are intelligent in a variety of ways, and his call to educators that a narrow definition of intelligence was short sighted and destructive of societal objectives was a profound moment in educational history. But why have schools done so little to actually implement a multiple intelligences approach? Perhaps we've made it much too hard for ourselves. Say a teacher notices that he or she has some super-smart kinesthetic learners, some auditory learners, some visual, and a few math whizzes thrown in to boot. How is she or he going to devise a curriculum (most teachers don't get to design curriculum, but if they were) that encompasses all the various learning styles in the classroom? The simple answer is that only the very best can, most don't and none are given necessary preparation to do so. But when teachers do real things with their students that involve all the senses, in real learning activities they have created the ideal learning environment for all intelligences. When students study every subject from books, or computers or laptops that all feel the same, smell the same, and sound the same as pages are turned, don't expect that to be a multi-sensory, multiple intelligences approach to learning and do not expect very much real learning to take place. But put a kid in a lab or workshop in which all human senses are put to work and real lasting enthusiasm for learning will follow. I'm calling for some simplicity here. To set up learning environments in which the teacher must act like a pharmacist administering customized lessons to each individual learning type is not reasonable. So I urge all teachers to make things easier and more effective... In schools (at all levels), do real stuff and allow real learning to follow. What follows is a short piece composed for the Clear Spring School newsletter to share with parents, grandparents and supporters, the role the wisdom of the hands program plays at our school. Most early educators from Comenius in the 17th century to John Dewey in the first part of the 20th, shared an understanding that children learn best through their senses and from their activities. And so, it should come as no surprise that for many of the children at Clear Spring School, woodworking has become a favorite activity. When students walk in the door of the wood shop they are greeted by the smell of fresh sawn wood. When the children take their places at the workbenches, the sounds of sawing and hammering commence. The sight, sound and smell of real wood being formed for new use is exactly what the early educators were talking about-- students learning from their own activities and from their senses rather than from dull lecture notes, or from pre-packaged lessons delivered under contrived circumstances. 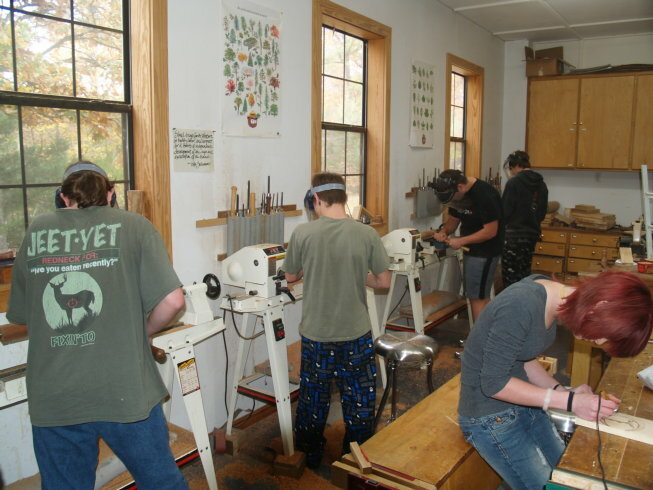 While most schools in the US have eliminated woodworking programs, parents might wonder why one of the smallest NAIS accredited schools in the country would have wood shop. Sure, it's a program that almost all students enjoy. It is fun to make things, and if you are a parent, you may have noticed the pride students feel for the objects they have crafted in wood shop. 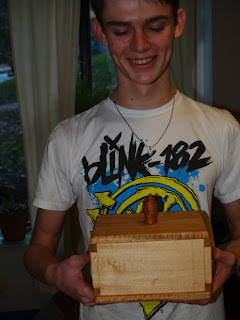 But there are many reasons for wood shop beyond the fun students have, and beyond the pleasure they may feel from the objects they have made. Otto Salomon, one early advocate of woodworking education said that the value of the carpenter's work is in the objects he makes, but the value of the students' work in making similar objects is in the student. He was suggesting that the real value of the objects the child makes in wood shop can be observed in the child's growth of confidence, her skill in creative problem solving, his close scientific observations as real materials are shaped, her development of skill in the use of tools, and as each child develops his or her self-image as a creator of things that may be of service to others. Schools tend to offer one of two choices to our children... that of being consumers of ideas and products, or that of becoming makers and thinkers prepared to test their own creative notions. An education at Clear Spring School is clearly directed toward the latter. You may remember from your own school experience, that wood shop was where they placed students who were not going to college. Ironically, the first wood shop/industrial arts programs in the US were created for a completely different reason. They had nothing to do with finding a place in school for those who could not handle academic subjects. Calvin Woodward at Washington University and John Runkle at MIT (where the school motto is Mens et Manus--mind and hand) realized that their engineering students were handicapped by having no experience in the practical arts. Woodward and Runkle started woodworking programs to provide practical experience as a foundation for abstract academic thought. The success of their programs revolutionized American education for a time, helped us win two world wars, and led the US to become the world's center for innovation and quality manufacturing. But the pendulum made a big swing back. If we take a good look at where we are now, we begin to see that a grave error was made in failing to see the full impact of hands-on learning in our nation's schools. It seems that by now, with all the attention given to education, things should be better. But despite 10 years of No Child Left Behind Legislation, teaching to the standardized test, use of iPads and smart boards in the class rooms and who knows what else, children in record numbers are dropping out. They spend too many hours sitting idle and bored in sensory deprived classrooms, despite the understanding of early educators that children learn best from their senses and from their activities. Clear Spring School offers a somewhat low-tech solution to education. We don't offer all the latest in high-tech gadgetry to enhance learning. But children have not really changed that much since Comenius. Helping our students develop an inclination toward lifelong learning is our primary goal. We can see from the level of heart felt enthusiasm that our children express each day that hands-on/hearts-engaged learning really works at the Clear Spring School. You may wonder about the things students make. 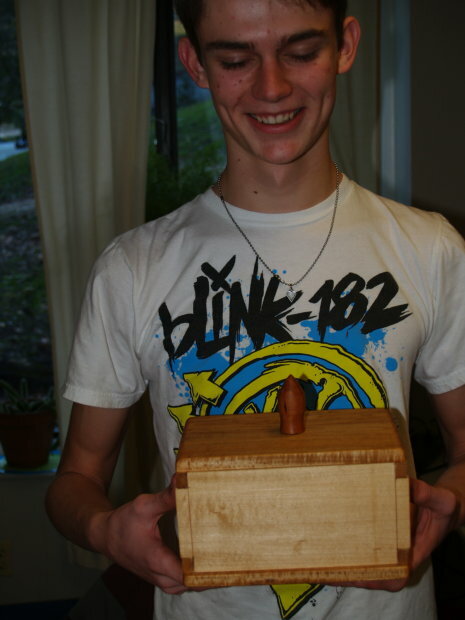 Our woodworking scholars all love making interesting things from their own imaginations and of their own design. Making those things are important. But we also make things that are intended to encourage greater hands-on investigation in their other classes. For instance, this year, the lower elementary school students have made weather vanes for study of wind, abacuses for study of math, and writing pens to begin writing in cursive with real ink. The idea is that wood shop should not simply be an isolated activity at Clear Spring School, but one that brings extra value and deeper engagement in studies throughout the school. On a related subject, Frank Wilson, author of the Hand sent me a link to an essay called a Brief Rant on the Future of Interaction Design. Watch the video showing our glorious intended future and the read the essay which accompanies it. We think of metaphors as being literary devices. My love is a rose. No, not exactly. But the use of the expression may say something about what one feels. And then again she may have a scent, have blushing beauty, and THORNS. We know that tools and processes can serve as metaphors to explain things in real life as well. So what is the fine line between metaphor as a literary device, and the use of metaphor as a source of hypothesis and creative physical exploration? If a hammer can do this, can a hammer be used for that, too? Yesterday in the blog I mentioned Sir William Petty, one of the founders of the London Royal Society and one of the first to describe an educational system reliant on the hands to develop intellect. The following is from Charles A. Bennett's History of Manual and Industrial Arts, volume I. In addition to his literary work-house for children, Petty proposed a college or society or gild of tradesmen. 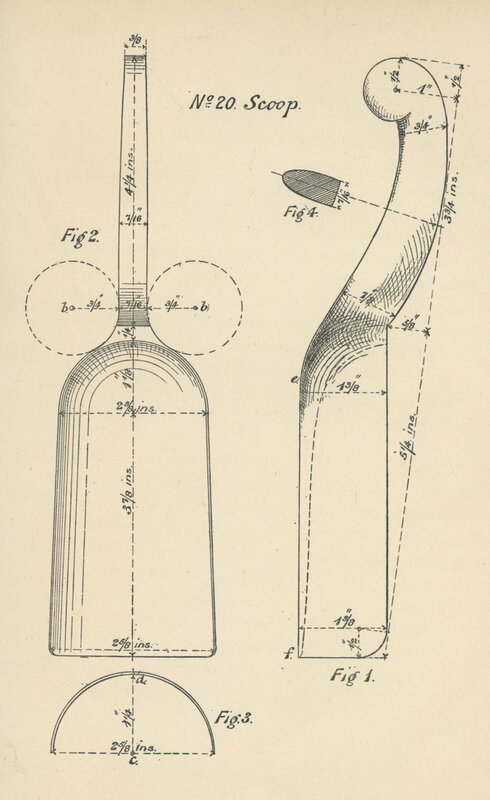 It was to consist of several expert workmen representing different trades grouped together for the double purpose of the production of fine examples of craftsmanship and the advancement of "mechanical arts and manufactures." In this institution he would have written a book laying open the "mysteries of trades." It would also describe in detail the manual process of each trade. And so you can see in the writings of Petty, the groundwork laid for Moxon's Book of Trades which was begun 30 years later. It provided a literal warehouse of metaphoric potential for those members of the London Royal Society who wished to expand their own intellectual and physical research capacities. To fully understand one physical process provides (through the use of the human capacity for metaphor) the ability to extend and expand human capacities. As scientists and philosophers, Sir William Petty and his collaborators in the London Royal Society, knew that the skilled intellectual pursuits of hand and mind were best not left alone to the poor and undereducated. It is a pity we have lost that understanding. Friday was a very special day at the Clear Spring School. 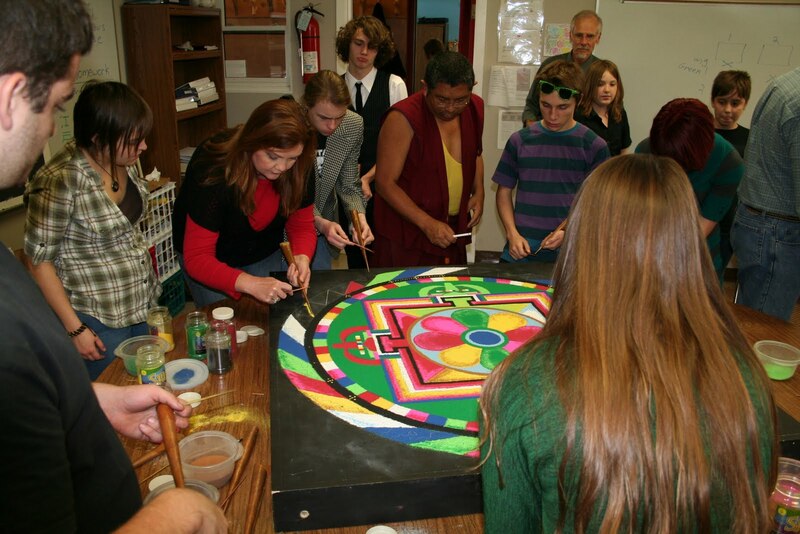 We had a visiting Tibetan Lama on campus, complete with monks and DIY sand mandala making. If anyone had any particular doubts about CSS being one of the most profound educational experiences they would have been dispelled by a visit on Friday. Today the students at Clear Spring School will begin our annual toy making project to make toys for holiday distribution through our local food bank. (1) That literary work-houses be established "where children may be taught as well to do something towards their living, as to read and write." (2) That all children above seven years of age be given this kind of education, none being excluded by reason of poverty, "for hereby it hath come to pass that many are now holding the plow which might have been made fit to steer the State." Children of poor parents might work longer than others if in need of earning. (3) "That since few children have need of reading before they know or can be acquainted with the things they read of, or of writing before their thoughts are worth the recording or they are able to put them into any form" that these be deferred awhile and, "in the order of Nature," that children be taught first "to observe and remember all sensible objects and actions, whether they be natural or artificial." (4) "That they use such exercises, whether in work or for recreation, as tend to the health, agility and strength of their bodies." 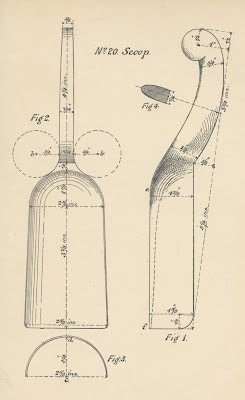 (5) "That in no case the art of drawing and designing be omitted, to what course of life soever those children are to be applied, since the use thereof for expressing the conceptions of the mind, seems (at least to us) to be little inferior to that of writing, and in many cases performeth what by words is impossible." (6) That all children, though they be of the highest rank, be taught "some genteel manufacture in their minority." (Here he lists 15 various occupations including 6 that make use of woodworking). He then states eight reasons why students would benefit from this education. 1. They will be less liable to be cheated by artificers. 2. They will become more industrious in general. They will certainly do most excellent work, being gentlemen, ambitious to excel ordinary workmen. 4. They, being able to make experiments themselves, may do it with less cost, and more care than others will do it for them. 5. The arts will be much advanced, when such as are rich and able, are also willing to make enlightening experiments. 6. It may engage them to be Patrons of the Arts. 7. It will keep them from worse occasions of spending their time and estates. 8. As it will be a great ornament in prosperity, so it will be a great refuge and stay in adversity and common calamity. What more can I say? Before I let Sir Richard Petty have the last word, I will remind my readers that I will be on a radio talk show interview from 2-2:30PM Pacific Standard time. You can listen in through the link at Ed Talk Radio. To ask a question, call 877-211-4525. Readers who missed my interview can find it recorded here. How do you spell oops? Yesterday a report on the front page of the Arkansas Democrat-Gazette noted that nearly 45% of schools in Arkansas are failing to meet achievement goals under the No Child Left Behind Legislation. Some of the schools are in the wealthier parts of the state, and some of the failing schools are charter schools intended as the cutting edge of educational reform. How do you spell oops? If were to want to more deeply engage children in learning, we would give them real hands-on learning to do. But it seems we do not. I have been invited to be a guest on a call in radio program in Sacramento, California dedicated to education reform, Ed Talk Radio. You can listen through their website. The radio host, Paul Preston is a long-time supporter of career and technical education. My half-hour interview will be at 2 PM PST. If you are in Central time zone, please tune in at 4 PM. My interview will last for 30 minutes. If you are in the US or Canada, you can call in toll free at (877) 211-4525. International callers should note that Pacific Standard Time is 8 hours behind GMT. I will be taking questions about hands-on learning. If you call, please introduce yourself as a blog reader. This morning, I have been contemplating how difficult we have made things in school. It is difficult to sit still. It is difficult to keep one's attention on the subject. For the teacher it is difficult to keep children's attention focused on their lessons without becoming tyrannical. A local public elementary school teacher, commenting on the challenge of her work said, "Each day is like planning a party for 25 kids." And while that might sound like fun, it is also relentless. It is certainly not easy, even for the best. Children these days with all their digital devices and video content, who fall asleep at bedtime with the TV going, are not easy to entertain, let alone teach. And yet, for children to learn is the most easy and natural of human functions. We are wired for it. When awakened by a fire for learning as Mike Rose describes in his blog post, Full Cognitive Throttle children are voracious learners. 1. "Theory," says Vives, "is easy and short, but has no result other than the gratification that it affords. Practice on the other hand, is difficult and prolix, but is of immense utility." Since this is so, we should diligently seek out a method by which the young may be easily led to the practical application of natural forces, which is to be found in the arts. I was lucky in my youth to have a trained kindergarten teacher as my mother, and she kept my sisters and I busy with paper, scissors, glue, string, paints and clay, and so we learned that learning was not just about what happened in our heads, but what happened in our hands as well. 7. The use of instruments should be shown in practice and not by words; that is to say, by example rather than by precept. It is many years since Quintilian said: "Through precepts the way is long and difficult, while through examples it is short and practicable." But alas, how little heed the ordinary schools pay to this advice. That was written by Comenius in 1631, so you can see we've kept education heading in the wrong direction. Today I'm working in my own wood shop. 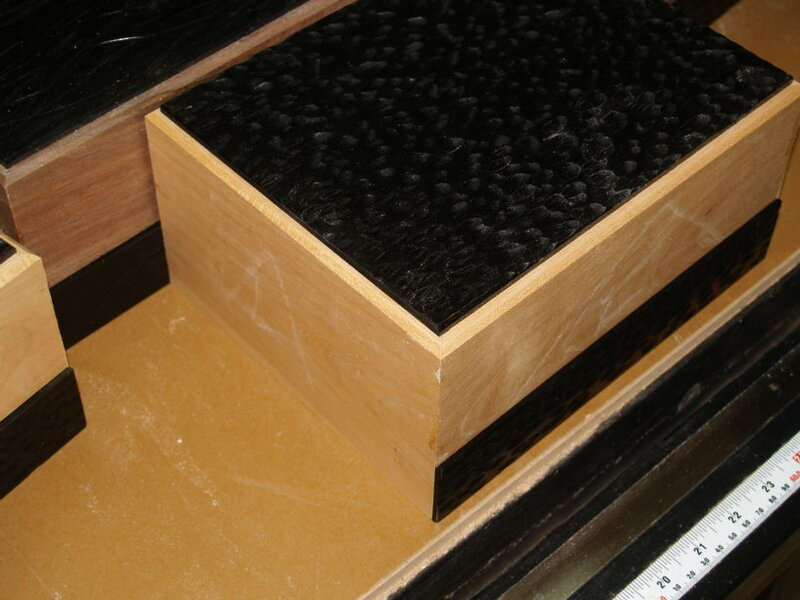 I started making a series of small jewelry boxes yesterday, and today should get to the point of making drawers. 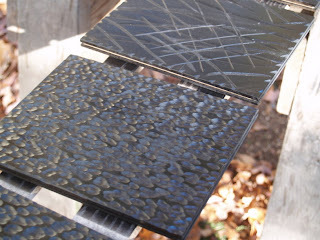 The textured and painted top panels can be seen above. The assembled boxes with drawer fronts can be seen below. If your child is not catching fire for learning at school, turn off the TV at home and offer some real things that can be learned in his or her own hands. You can register to win a copy of my new book Building Small Cabinets by commenting on this post on the Fine Woodworking website. I would love for one of my regular readers to win. 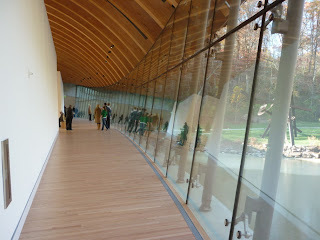 My wife and I attended a preview opening of Crystal Bridges Museum of American Art yesterday. The official opening will be 11/11/2011, or this Friday. Please don't think you can just show up, even though attendance will be free. For the first month or so the attendance is expected to be huge and you should reserve your tickets on-line through the museum website. A friend of ours got a 5:30 AM time slot, and found it worthwhile, even getting up at 3:30 AM to arrive on time. My wife and I had a lovely day, and will go back again and again. The work is sublime. The building is exquisite, and will no doubt become regarded as an architectural tour de force. Curving glass walls and glue laminated curved ceiling joists form bridges spanning two lakes and a small watercourse through a natural hollow on land that had been a personal nature preserve owned by Neil Compton, father of the Buffalo National River. My own small boxes are featured in the museum gift store along with works by other Arkansas artists, including basketry by Leon Niehues. One of the first pieces we saw as we entered the museum was work by my good friend Robyn Horn. It is carved redwood and shown in the photo at upper left. At above you see curved glass forming the boundary between the interior and exterior space of the museum grounds. The grounds will become even more beautiful now that the major construction is complete. 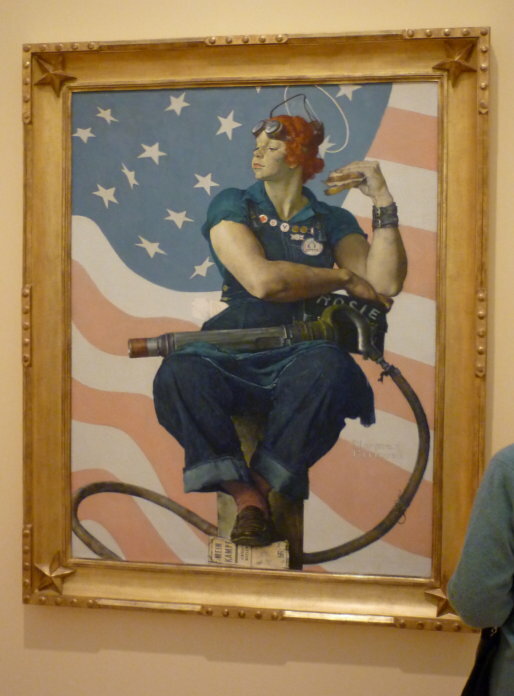 And then of course within museums we find work of historic significance and emotional effect. At left is the famous Rosie the Riveter. Readers of this blog will enjoy a piece written by Mike Rose, author of Mind at Work, Cognitive full throttle: When Education for work ignites the mind. Also, I want to remind my readers that you can enter to win a signed copy of my new book, Building Small Cabinets on theFine Woodworking Website. 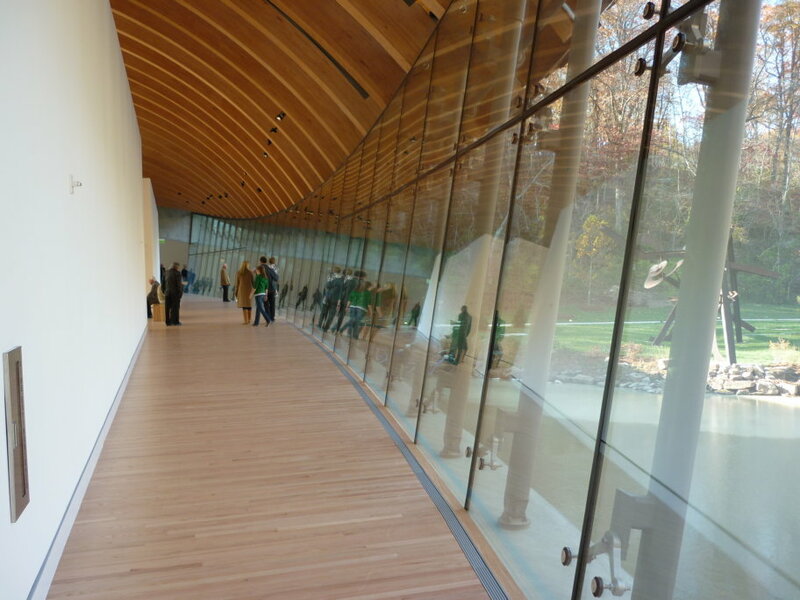 Today I am going to a preview opening of Crystal Bridges Museum of American Art in Bentonville, Arkansas. It is a fabulous new museum dedicated to bringing some of the greatest American art to my own state, so we are very excited about it. Some of my small boxes will be sold in the museum gift store, and some of my students had helped me make a walnut bench from wood cut from the site as the initial ground work was done. "The two direct results of instruction in the manual arts are, first, power to do, and second, ability to appreciate what is done by others... Froebel tells us that "man only understands thoroughly that which he is able to produce." Accepting this statement as fact, we see that it is only through mastery of processes, tools and materials, color, form and values, laws of construction and harmony, that we can completely understand any masterpiece of art or handicraft. And we know from experience that such mastery is exceedingly difficult to acquire." In other words, there are two ways that great works in museums are secured. One is with walls and curators, the other is within the hands, minds and hearts of those whom we would hope to attract to those museums. We cannot hope to gain active participation in preservation of great art from those who know so very little about the making of it. Bennett suggests that because we cannot teach children all the valuable techniques required to appreciate great art, we have taken another track. "We throw aside the philosophy of Froebel and work to store our minds with facts about the arts, in the hope that by this means we may reach our goal of appreciation. We search the latest books and magazines. We read what Mr. A. says of the opinion expressed by Mr. B. concerning the work of Mr. C. We find that Mr. D. does not agree with either Mr. A. or Mr. B. on several important points, and we take little satisfaction in knowing their combined opinion. When we are honest with ourselves we admit that we do not appreciate the real thing they are writing about... We can talk "arts and crafts style" or we can discuss the report of the latest exhibition, and quote good authorities too, but we are conscious of the fact that this is not appreciation. We know that appreciation involved feeling, and and this newspaper reading has begotten no art feeling in us. We would not only know about art, but we would feel--we would respond to the influence of the art;; we would have the artist's emotions transmitted to us, and this we find does not come about thru the medium of the words merely. We must see and touch and do; we must get our knowledge first-hand; we must learn thru experience. In learning about the art we have avoided the thing itself..."
By teaching art history and art appreciation without actually making anything, we may offer some students a false sense of academic mastery over the arts. It is my belief that to do something really well, whether it is in the arts or music, offers insight into human culture and creativity, that serves as a platform for the appreciation of other arts (or crafts) as one learns the process through which the person is shaped by the creative process. But to leave students untouched by this process may leave the whole of human creative and cultural legacy at risk. In answer to this dilemma, some art teachers would propose a smorgasbord offering of the arts, for students to dabble within. That is better than no arts at all, but in order for students to fully understand great art, it is important for them to work in the direction of mastering some specific craft or art. Yesterday in cutting dovetails, one of my students asked, "Don't they make a machine for this?" Is that where we would find the most growth? On another topic, Fine Woodworking ran a contest to win a copy of my book Building Small Cabinets. One hundred ninety six readers competed, and one copy was given away to a lucky winner. I've extended the contest with one more copy, but as a special bonus this one will be signed. 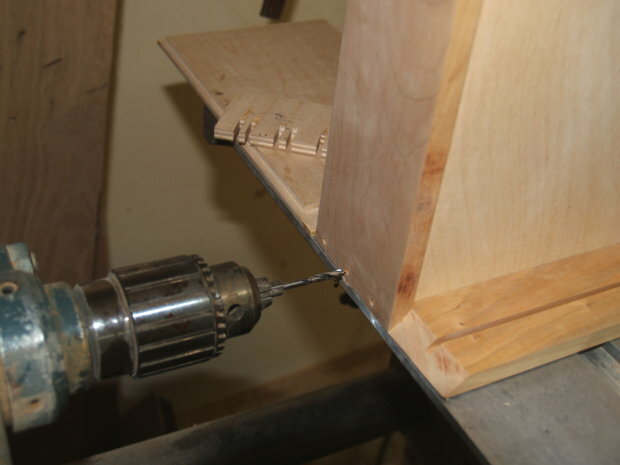 If you want to enter to win a signed copy of Building Small Cabinets, go to this Fine Woodworking blog post and and leave a comment. In the ordinary school environment, language and math have been given the upper hand, while those who have taught manual arts were afforded a status in some cases more or less akin to that of the school janitor. In an ideal world, the janitor would be granted profound respect, though in too many cases we've been taught he should not be. In the theory of Educational Sloyd, Otto Salomon outlines a number of reasons that Sloyd should be taught by an ordinary trained teacher rather than by a trained craftsman or artisan, but his argument is not that one is better than the other at what they do, but that their objectives differ. The craftsman must look at the economic development of the object, while the teacher must be trained to foster the development of the child. His most compelling argument however, for the teachers of the common school subjects to be also the teachers of sloyd is as follows: Salomon had noted "the scholars of London and Stockholm were wont to look upon their artisan teachers with indifference and contempt." Even at a young age and in such early times the social divide pitting the mind against the hand had taken its toll. "From a social point of view... it is of vital importance that the ordinary teacher of the school be employed to teach this subject, for he is looked upon with great respect by his scholars--in many instances with profound respect--and whatever he puts his hand to, the scholars will not only not be ashamed to do, but rather take a pride in doing." A tragic and disruptive divide between classes is even more true today than it was then. The blue collar/white collar divide has been in place for so long, and children have no longer been trained in simple crafts while in their homes, and would likely have no sense of the value of trained hands, and have no idea of what they and their own intellectual development will have missed. The important point of reassurance that can come from this, however, is the understanding that one need not be the perfect skilled craftsman to effectively teach woodworking or some other craft to children or to find value in it, or to be of great service in doing so. The teacher wishing to teach the dignity and value of all work, and to convey the intelligence that comes most naturally from working with hands, need not wait for prior development of any particular skill as an artisan to do so. You need to be a good, caring teacher, but you need not be a craftsman yourself. Hand-Craft in wood is distinguished from carpentry or joinery in many important respects. There is no division of labour. Everything produced is the entire work of one operator, or the defects of which he is solely responsible. This directness of responsibility is one of the great merits of Hand-Craft, being calculated to promote wholesome pride in the excellence of complete work; a sentiment that is apt to be very weak, or totally wanting, where division of labour is much relied upon. The intellectual faculties are brought into unison with the hand, by knowledge and experience developing together with increasing dexterity. Genuine respect and sympathy are developed for manual toil by familiarity with its application. Love of work in general is developed, and a taste for it instilled by practical experience of its utility. Habits of attention, perseverance, industry and discipline are formed, cultivated, and unconsciously grafted upon the pupil, by the application necessary to excel. Independence, order, and cleanliness spontaneously grow and become part of the nature of the operator. Manual dexterity being thoroughly established, the operator is endowed with the consequent acquired ability for dealing with the practical business of life. Education being the object that should be constantly kept in view, in the teaching and practice of Hand-Craft, it should be thoroughly appreciated that it is adapted for forming and shaping the entire bent of all the faculties. The objects recommended to work upon are all small, and are therefore within the capacity of the very young, and of both sexes. For the same reason, the eye, the hand and the judgement are trained to precise form and finish in the minutest details, This is important, for, though it is generally easier to make something large and rough than small and smooth, no one who is incapable of making a small model well can make a large one any better. Small objects are invariably the best training to work upon, as being certain to inspire appreciation for neatness, exactness and accuracy. Today my fall break came to an end. I returned to my classes at Clear Spring School, having had a great week working in my own shop. Some of my high school boys are taken with the lathe, and work to surpass each other in smoothness of finish. Tyler went the other direction today, learning that by turning aggressively, he could create a vibration in the stock which gave a spiral effect. At left,you can see some of my new boxes just after the finish has been applied. In learning, there needs to be a balance between information and experience self-gained. This was one of the challenges faced by Salomon and others in the development of educational Sloyd. How would they lay out the progression of models to gain the most educational effect? There could have been so many models that each would lead seamlessly into the next, with each informing what to do in the next model, by making only the smallest of changes in each. But what we find in an examination of the various model series is that they did not. The models present plenty of opportunities for head scratching, and for asking the professor of Sloyd, "What do I do now?" or "How can I make this cut?" And there were spaces in learning left to the child's imagination and experimentation, allowing the student to develop his or her own problem solving capacity. And the relationship developed thus between student and professor of Sloyd was so strong that in Sweden today many old Sloyd professors are still remembered by their students with great fondness. 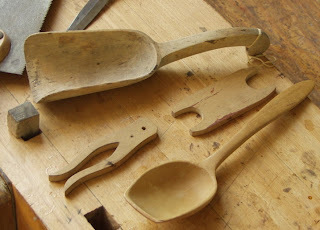 The model shown at left is from John D. Sutcliffe's book Hand-Craft Slöjd published in 1890, and if you can imagine a 13 or 14 year old boy carving this scoop, you can also imagine the amount of intelligence and skill that children had at that time and do not have today. We fill our children's brains with too much information, and their minds with too little challenge in the way of real problem solving, and their hands with too little skill. Sure, they can move their fingers quickly on tiny keypads, but can their hands do anything else? We present to them a world in which ease of use is the mantra to guide in the acquisition of new stuff. How about having schools in which the purpose is to do difficult things, to develop the hand and mind for real problem solving and service to others? A finished scoop is shown in the photo below, taken when I was visiting the original school at Nääs, Sweden. Thousands of pounds of original Sloyd models were burned at the school during a clean up years ago. Fortunately a few of the original models were saved at the last minute. "...in educational Sloyd the teacher addresses only one pupil at a time, while in class-teaching all children are addressed at the same time. A signal is given for all to stop and listen to what the teacher has to say; hence the train of thought of each individual is broken and attention, instead of being developed, is arrested and destroyed; the child forms a habit of breaking off a train of thought, instead of persisting in its continuance. Not only so but progress is also retarded; an express train gets over more ground than what is termed a slow train, not so much because of the difference in the highest rate of speed which each engine acquires, but because the slow train has to stop at all stations, and loses so much time in slowing off and making up steam again. So progress is checked in the individual when a train of thought is broken, and the more frequently it is broken, the slower necessarily will be the progress made." In Salomon's allegory the fast train is Sloyd, or individual teaching, and the local train represents class teaching, though it may be hard at times to assess which train is which. Surely a teacher using a class teaching method can cover more ground in less time with the passengers seeing fewer sights. The question is whether or not any of the students will actually arrive at the station with any real knowledge after being run through the countryside at such speed and with so little individual attention. The overwhelming evidence proves that far too many will not. If the subject matter is thought to be important, one would assume that it would be important for all students to understand it, and that each would thus actually receive the attention required to arrive at the station. But what we learn (and children who are no dummies also learn) is that despite the very best intentions of each teacher, the system will not allow each and every student's success. "From a purely practical, i.e. a utilitarian and economical point of view, it is said that class-teaching is necessary to get any appreciable quantity of work done." But the current state of American education offers conclusive evidence that it does not work. One thing that students do learn is that the content of learning is not important. Offering evidence of ability to learn is the only thing that matters. Some will gladly play that game, but others for a variety of reasons will not. But with individual teaching two important messages are conveyed. The subject matters, and each child matters. Those two principles are built into the approach. But once classroom teaching leaves the station, it will stop for no child. On a converging topic, the state of Arkansas is having to beg off from key provisions of the No Child Left Behind Act, according to a front page article in today's Arkansas Democrat-Gazette. Arkansas just can't make it with 400 of our 1100 schools failing to meet goals. It frustrates me that the answers to today's problems in education were offered in the 1880's and still not understood today, and are so very far from current educational thought. Today I am occupying my wood shop. I cut lids from bases. I spent some time sanding. I'll put keeper strips on the insides of boxes so the lift lids will fit on in the exact place. If it doesn't rain, I'll spend some time in the yard raking leaves. Before I get into the meat of the subject, I want to share two videos that came to me this morning. The first is from a rasp maker in France, Noël Liogier and it shows the interesting relationship between hand and mind. I think you will enjoy seeing how the patterns of the rasp are derived from the geometry of the hand and body. Richard Burman is a Canadian hand/mind entrepreneur/film maker who has developed the Working Hands Project to further an interest in hands on learning. You can help his project become further developed by voting for its support at Cuban Hat, where several Canadian documentary film makers are in the running for support. Register and vote for the hands. The following is more from Otto Salomon's Theory of Educational Sloyd on the advantages of individual teaching. In class teaching the rate of progression is fixed according to the estimate of the average capacity of the children, and, as a consequence, the more capable children are told too much and the less capable too little. Instruction in class teaching doesn't accord with the capabilities of individuals who are above or below the average ability of the whole class. Those who are told too much are not trained in forethought, reflection, and self-reliance, their tendency to voluntary exertion and action is thwarted, and where there is no exertion there can be no true development. Those who, being below the average capacity, are told too little, are either overstrained and get to dislike the work, or are discouraged and disheartened and give up hope of success; and if they do this they may as well for all practical good give the subject up entirely. It would be far better to do so, as the continuance of it can only have a pernicious effect on the character of the child. Further, we must recognize the fact that as children have not the same ability in understanding, neither have they in execution. In their manual work children are very unlike. In the execution of the work it is impossible to keep them together in a natural way." This may seem very abstract to most readers. How can relatively large numbers of students be taught as individuals? Salomon discovered what he called his "Columbus egg." Otto Salomon's Columbus egg was the idea of arranging student projects in sloyd sequentially according to difficulty, complexity, tools used, and skills developed so that the teacher's job would be that of giving individualized instruction when required. Believe it or not, that model can be used in every subject toward the individual learning needs of each child. As you can see in the photo at left, I have been continuing with my OWS, occupy woodshop movement. It is better than having to be on the streets and it is better than being under the corporate thumb that has done so little for the American people during this time of economic crisis. these boxes are for a customer who buys my boxes for his staff each year at Christmas time. Each has a collection of my boxes. "A number of children who are being instructed and addressed at the same time by the teacher may be regarded as being individually taught, when the intellects *(and interests) of all those under instruction are at the same stage of progress, and this is the limitation we must add to the definition with which we started. If, for instance, a new subject is going to be taught to a number of children simultaneously, and none of the children know anything of it, the teaching is individual teaching, because there is equality of mind, which results from uniformity of ignorance about the new subject. Salomon suggests that this can be partially remedied by next arranging the students into smaller groups each at the same level of understanding, but that these again must be next divided into smaller groups, and ever smaller groups down to the individual if teaching is to be effective. Salomon believed that Educational Sloyd was not a school subject, but rather a means of education that could be applied as a model to every subject. "All good education must be based on the nature of the child... In nature there are no two things exactly alike--no two trees, flowers, human forms or faces. No one will assert that the natures--physical, moral, or mental--of any two children are the same. If this be granted, it readily follows that class teaching, as a means of education, is not good either in Sloyd or any other school subject... Class teaching may be good economically, but it is bad educationally." Given the inefficiencies of class instruction, it would seem that if the subject really mattered, (and the lesson drawn by so many kids is that it does not) we would teach it in a manner in which we knew it to be understood by all children in the class. There are some important interpersonal connections made during individualized instruction. The student is made to feel that someone actually cares both about the subject and about his or her success in mastering it. There is a big movement to use computers to create individualized learning opportunities in schools. This may be a way to eliminate caring staff. One must truly hope not, for to be taught individually by someone who truly cares, whether in art, music, history or math seems to have become a luxury in American education. For an earlier post on a similar subject I refer you to Children are not clockwork. I want to share an exquisite essay by David Brittan, who had written an earlier piece I had shared with my blog readers, Mr. Mens meet Mr. Manus. David is the editor of Tufts Magazine, a reader of this blog, and one who understands the significance of the hands in the making of both civilization and self. His essay With Hands Like These can be found here. "Class teaching comprises the teaching of two or more children. Individual teaching comprises the teaching of one or more children. The aims of the teacher are not the same in the two cases. They differ materially. In class teaching the teacher is apt to regard the class as a unit. It is not the development of the individual scholar, but of the individual class that is aimed at. The minds of the scholars composing it are at various stages of intelligence; they differ also in ability (and interest). The efforts of the teacher are directed to assimilating these differences and to securing a uniform rate of progress among all the members of the class. On the other hand, individual teaching, the development of each child is the aim kept prominently in view. No effort is made to harmonise differences in ability, nor to advance the children with equal paces. The best teachers will make their methods approximate as much as possible to those employed in individual teaching." This section of Otto Salomon's book, gathered and edited from lecture notes given to his students at Nääs is one of his most profound contributions of Education. So I may stick with it a few days. If it bores you, do other things.